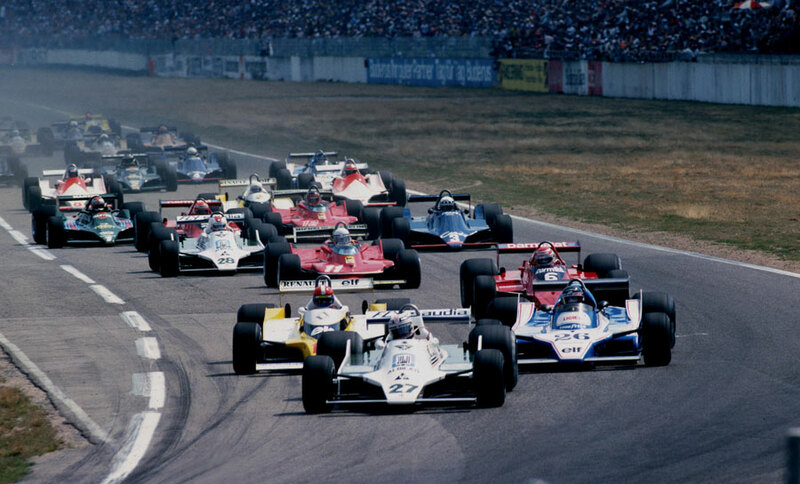 Alan Jones won the German Grand Prix at Hockenheim despite his engine misfiring during the final stages and crossing the finishing line with a punctured rear tyre. It was a deserved victory after his disappointment at Silverstone a fortnight earlier, and with Williams team-mate Clay Regazzoni taking second, it underlined that Frank Williams had a car to be reckoned with. The turbocharged Renault of Jean-Pierre Jabouille took pole but was again outpaced off the line. Jones took the lead at the start but Jabouille was soon challenging until his engine blew. "I was right up Alan's exhaust pipe and I thought I could pass him but 'boom' and I lost it and could not restart the engine." The second Renault of Rene Arnoux was also charging through the field after starting in tenth but suffered a puncture away from the pits and also retired. When Regazzoni passed Jacques Lafitte for second place after 43 laps, the 1-2-3 order was settled for the remainder of the race. Jody Scheckter retained his lead in the championship with his fourth place which came despite serious handling problems on his Ferrari. Gilles Villeneuve also had a frustrating afternoon, battling back to finish eighth after a lengthy pit stop to repair a damaged wing. "I felt her misfire with about 20 laps to go," Jones said after his second career win and his first for Williams. "That slowed me a little but five laps later I felt the right rear tyre start to go down. There must have been only one or two pounds of pressure at the end. It was a case of going as hard as I could in the hope that the tyre wouldn't roll off the rim at slower speeds. I don't think I could have completed another two laps."